Semyon Ivanovich Dezhnev ( Russian: Семён Ива́нович Дежнёв, IPA: [sʲɪˈmʲɵn ɪˈvanəvʲɪtɕ dʲɪˈʐnʲɵf]; sometimes spelled Dezhnyov; c. 1605 – 1673) was a Russian explorer of Siberia and the first European to sail through the Bering Strait, 80 years before Vitus Bering did. In 1648 he sailed from the Kolyma River on the Arctic Ocean to the Anadyr River on the Pacific. His exploit was forgotten for almost a hundred years and Bering is usually given credit for discovering the strait that bears his name. In 1641 Dezhnyov moved northeast to a newly discovered tributary of the Indigirka River where he served under Mikhail Stadukhin. Finding few furs and hostile natives and hearing of a rich river to the east, he, Stadukhin and Yarilo Zyrian sailed down the Indigirka, then east along the coast to the Kolyma River, where they built an ostrog (1643). This was at the time the easternmost Russian frontier. The Kolyma soon proved to be one of the richest areas in eastern Siberia. 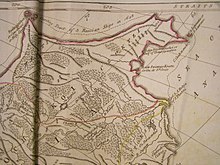 In 1647, 396 men paid head-tax there and 404 men received passports to travel from Yakutsk to the Kolyma. 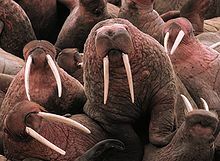 From about 1642, Russians began hearing of a 'Pogycha River' to the east which flowed into the Arctic and that the nearby area was rich in sable fur, walrus ivory and silver ore. An attempt to reach it in 1646 failed. In 1647 Fedot Alekseyev, an agent of a Moscow merchant, organized an expedition and brought in Dezhnyov because he was a government official. The expedition reached the sea but was unable to round the Chukchi Peninsula  because it had to turn back due to thick drift ice. From at least 1575 European geographers had heard of a Strait of Anián connecting the Pacific and Atlantic. Some had it at the Bering Strait (map at right) and others had it running from the Gulf of California to Baffin Bay. It is not certain that Russians in Siberia had heard of it. The first Western map to show a Strait of Anian between Asia and North America was probably that of Giacomo Gastaldi in 1562. Many cartographers followed this lead until the time of Bering. The source is said to be an interpretation of Marco Polo, but otherwise the documents do not explain where the idea came from.